Home » Uncategorized » PNC Festival of Lights Starts Shining This Weekend! PNC Festival of Lights Starts Shining This Weekend! The Cincinnati Zoo will once again be transformed into a “Wild Wonderland” for the 36th annual PNC Festival of Lights! 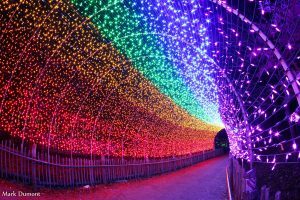 The PNC Festival of Lights kicks off this Saturday Nov 17 at the Cincinnati Zoo & Botanical Garden (3400 Vine St. Cincinnati). The beauty will continue every Sunday-Thursday until 9 p.m. and Friday and Saturday until 10 p.m., through Dec 31. Visits with Santa begin at 4 p.m. and the Festival of Lights activities begin at 5 p.m. In addition to admiring the beauty of 3 million LED lights, visitors can watch a Madcap black-light puppet show, ride the BB&T Toyland Express, search for fairies in Fairyland, marvel at the spectacular Wild Lights show on Swan Lake, or snack at one of two S’mores-n-More stands. The PNC Festival of Lights is included with regular paid zoo admission. To view prices and purchase your tickets in advance, visit https://ticketstore.cincinnatizoo.org/. For more information, visit http://cincinnatizoo.org/events/festival-of-lights/.